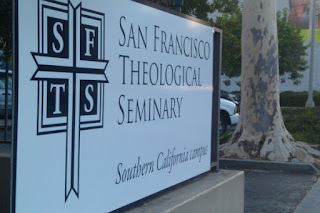 Last night was my final class session for my final class at San Francisco Theological Seminary. 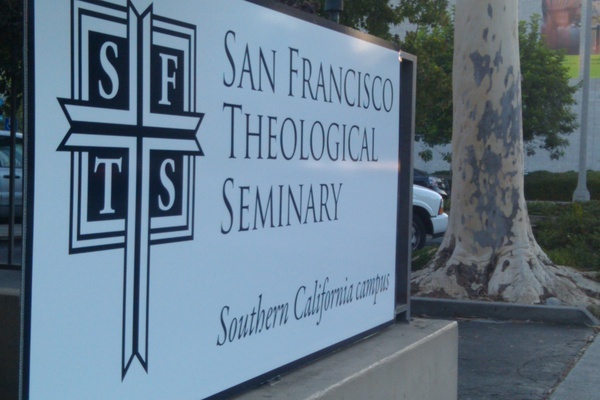 For those of you who don't already know, I have been working on my MDiv degree at SFTS's Southern California campus in Pasadena. About once a week, I drive to class and experience what I can only describe as a breath of fresh air. I chose SFTS not primarily because of its' academic rigor or its prestige but because of the community there. I went for a campus visit expecting just another commuter campus atmosphere but what I discovered was a faith community rooted in love and a commitment to learn and to grow from and with one another in humility and pastoral attentiveness. I might have thought such a community to be an impossibility under such circumstances, but it was there at SFTS and I wanted in on it. For two semesters I've been part of this community, learning and growing in a context and with colleagues quite unlike my own. The depth of blessing I received from my classmates and professors was profound and penetrating. But a few months ago, the Northern campus elites made the executive decision to save some money by eliminating the Southern California program and closing down the campus--effective June 2011. There was no real plan for the students, no plan for the faculty, just a closing date. It was inevitable that this community would suffer an untimely death. Well last night, as we gathered together for our last class, we went on the way we always had. We prayed together, shared with one another, challenged each other and explored together the complexity of ministry and context. Some of us are confused, most of us are uncertain about where we'll go from here but all of us are blessed to have been there--we will always have been there and that will always be a part of us. You hold in your hands every outcome and every expectation--ever blessing and every curse. You hold our stories and you cradle us in our fears. Finish the work you've started in us. Open us to new and creative possibilities even as we grieve and remember. Let us take with us that which you have given us through this life-giving community. May we not cling to the expectation we had but may we move and be used to reflect you for the world in need. Surprise us again with fresh grace and with the leading and guiding of your Holy Spirit. Amen. May mercy show you what you could not see" -Kendall Payne "Pray"